We’re standing on the Welcome Mat, knees shaking with cold and excitement. We can almost identify the song twinkling from the stereo inside. Through the window we see the shadows of our friends flickering on the wall. When the door finally opens, light, laughter and music swirls us into the warmth. We obey the “Come-In Come-Ins”. There’s a round of hugs and of cheeks offered to lips. Predictably and yet magically, there are drinks in our hands. We’re laughing and chattering and having too much fun to notice that our own shadows have become one with the others on the wall. OH! How we love going to parties! There is so much about them that I enjoy, the people, the music, the food (oh my! the food!). But mostly it’s the little touches. It’s those things that the hosts have done to make us more comfortable or to make things more festive or to make everything sparkle. Different people add different personal touches to a party. It could be a carefully selected soundtrack for the evening, lots of fresh flowers, lovely moisturizers and breath-fresheners in the bathroom, an abundance of easy-to-eat finger food, plenty of surfaces for people to set down their drinks, handmade cookie place cards for a seated dinner, a silly little get-to-know-each-other-game. Everyone has their own way of making their party a unique, fun and welcoming event. While there are a lot of little touches that I add to our parties, my favorite is a focus on the drinks. Drinks are usually the first thing you offer to guests when they arrive so having something special to serve lets everyone know from the beginning that it’s going to be a magical evening. When it comes to Thanksgiving, and the holiday season generally, I often put my mark on the event with a warm drink. How nice is it to come in from the cold and be welcomed with something to really take the chill off? 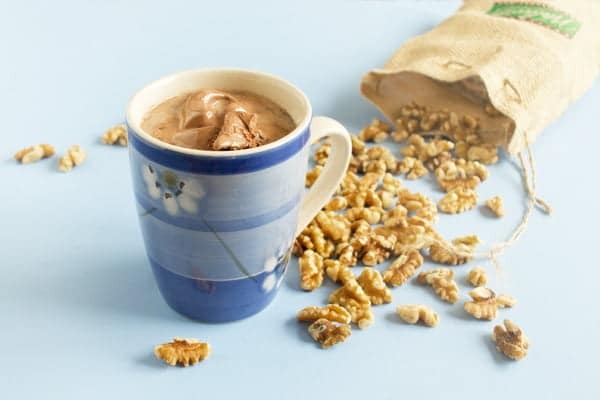 For the next couple of weeks I’ll be featuring some winter warmers. 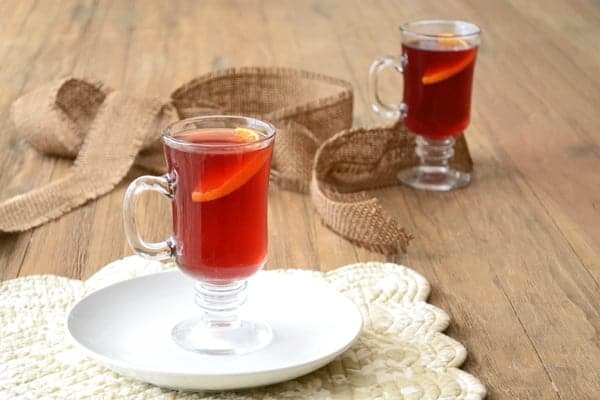 To get you into the holiday mood, I’ll be sharing two kinds of hot cider. Then I’ll be turning to some hostess gifts and Christmas gift ideas that are warm-drink-related. 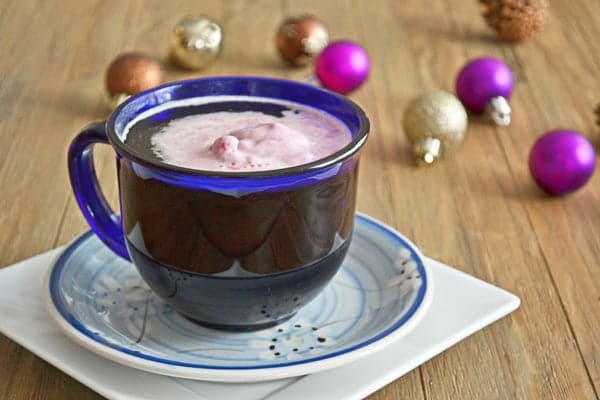 As we get closer to Christmas, I’ll be spiking hot chocolates and coffees with spices, ice cream, and booze. But never fear, for New Year’s I’ll be laying off the heat and embracing the razz-a-ma-tazz of fizz and ice cold celebration. So come along with me for some drinking fun that will add all kinds of special sparkle to your holiday party. The first recipe I have for you is a little twist on a classic hot apple cider recipe. 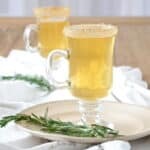 I decided to try rosemary in this cider to invoke the smell of evergreen trees, helping me to imagine that winter is here (even when I’m living in Florida and winter most certainly has not arrived!) and that Christmas will be here soon. If you have a lot of rosemary on hand, using sprigs as a garnish are just plain pretty. If not, a few fresh needles floating in the mug or sprinkled on a saucer are also a nice touch. 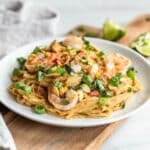 An update: Several days after publishing this post, The Hubs and I decided to make up another batch to sip on in the evening. But we were in the mood for a pre-dinner gin and tonic as well. So we decided to make the apple cider with rosemary as usual but to use gin instead of whisky. The result was even better than the original whisky version. A perfect holiday pre-dinner drink! 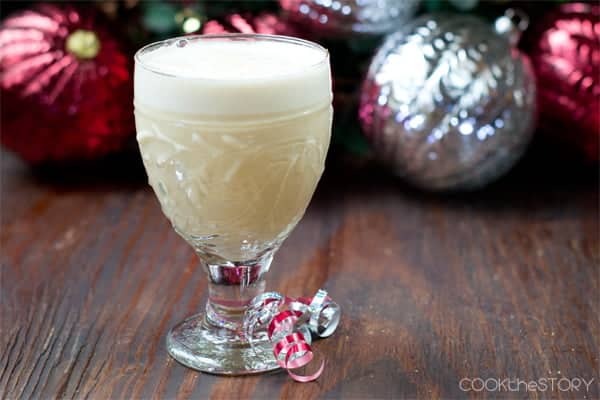 If you’re looking for another great holiday drink recipe, be sure to check out my light eggnog recipe, too. I hope you enjoy your holidays, and this hot apple cider recipe, too. 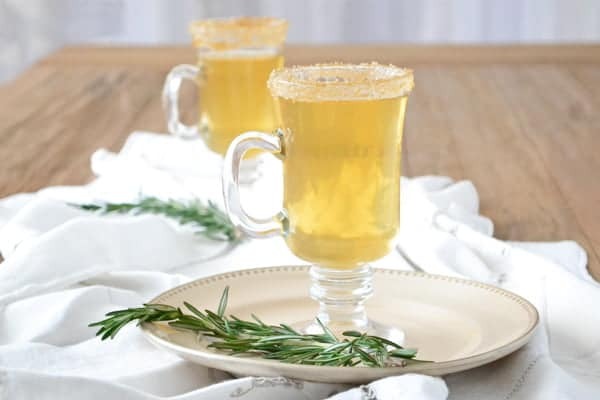 The alcohol and rosemary lend a grown-up touch to this warm, comforting apple cider. Combine the chopped rosemary and apple juice in a medium saucepan. Partially cover the pot of juice and warm it to a simmer over medium heat. 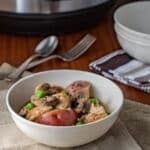 Reduce heat to low and simmer for another 10- 15 minutes. 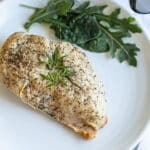 Taste a bit of the warm juice to see if it has infused with enough rosemary flavor to your taste. If not, let it simmer for another 5 minutes. Put a fine mesh sieve over a medium sized bowl. Strain the juice through the sieve. Rinse out the sauce pan and return the rosemary scented cider to the pot. Re-warm it over medium heat just to a simmer. Put the brown sugar into a soup bowl. Moisten the edge of each of four mugs with a bit of water or juice. Dip the moistened rim in the sugar, turning it a bit to coat the rim evenly. Divide the whiskey (if using) among the mugs. Fill the mugs with the hot cider. Garnish with a sprig of rosemary. I’ve included the optional whiskey in the ingredient list here. Note that I usually serve everyone’s cider without any booze and place the bottle nearby. Anyone who wants a drop (me!) can add. 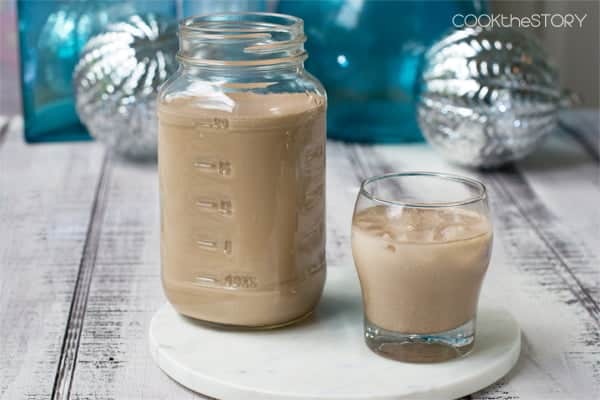 Anyone who doesn’t want any or isn’t old enough still gets to delight in the treat of a special holiday drink. Now tell me, my party-loving reader, what special touches do you add to your parties? I’d also love to hear about parties you’ve been to where the hosts have done something that made everything zing. 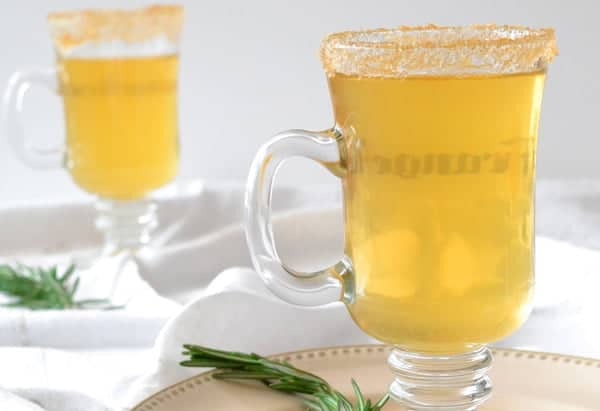 I’m not a big Apple Cider fan at all… this one looks so delicious and I love rosemary… I may have to change my mind. :) I like to set up a buffet and serve lots of easy to eat and pick on finger foods. I think that finger foods make everyone happy. Being able to graze and munch on small things at a party makes it easier to fit in the eating in between and during the socializing. Thanks Paula. And you’re welcome. I love your cookies and your cookie place cards are just the right pretty touch for a dinner party. Oh, that sounds divine! Perfect for a chilly night. Kerry, I would like to be a member of your family! How lovely to have bubbly all around at holiday times. We normally just have it on New Year’s but now you’ve made me think about having it on Thanksgiving too. What are your favorite things to cut it with?